We've renovated Vuo's user interface for the upcoming 2.0 release. Here's a preview of what's changed, including a first glimpse of Vuo 2.0 in action in our new Quick Start tutorial. You'll be able to take Vuo 2.0 for a test drive in a few months. More on that at end of this post. Since Vuo Community Edition 2.0 will be free for personal use and small organizations, we're hopeful that a lot more people will try it. To help beginners build their Vuo skills — and make sure we provide up-to-date information to everyone — we're revamping our video tutorials. Here's our new Quick Start tutorial that teaches the basics of Vuo in under 3 minutes. Confusion: This is the enemy. We do not wish to be confused, befuddled, and frustrated by our tools. The argument against complexity is due to the common misunderstanding that complexity leads to confusion. No, it doesn't have to. This is the role of good design: to make complex things simple to understand, easy to use, and delightful. Projecting 360° video inside an inflatable dome… mapping virtual 3D objects onto LED strips… using raindrops to trigger light and sound — these are the kinds of complex tasks that we hope to make simple to understand through Vuo. Since the very first beta release back in 2013, you, the community, have taught us which parts of Vuo succeed in simplifying your work and which parts are confusing. In response, we're continually working to make Vuo easier to use. Here are some of the simplifications you can look forward to in Vuo 2.0. In the Quick Start tutorial, you might have noticed that we controlled the timing of the animation using a Fire on Display Refresh node instead of the Render Image to Window node's Requested Frame port (which no longer exists). This change eliminates those long cables stretching right-to-left across your composition from Requested Frame ports to Time ports. Along with changes to the way cables are drawn (discussed later in this post), this will make it easier to follow the cables in your composition. From experiences like this, we found out that the input port at the top of every node, called the refresh port, was confusing. So in Vuo 2.0 we've gotten rid of it. At the same time, we've added a little time-saver. In Vuo 2.0, you can connect an event cable to the first input port of a node by dropping it onto the node's title bar. Those little views that show live data and events when you click on a port, called port popovers, have proved to be one of Vuo's most helpful features. In Vuo 2.0, we've made them even more helpful for image ports by showing a preview of the image. By the way, as of Vuo 2.0, port popovers work inside of subcompositions, too. A lot of people have been confused about how events flow into subcompositions. Through discussion with Philip, Teo, and others, we learned how to make this more intuitive. In Vuo 2.0, when an event hits a subcomposition node, it will only enter the subcomposition through the input ports that it hit (not all input ports as it did before). 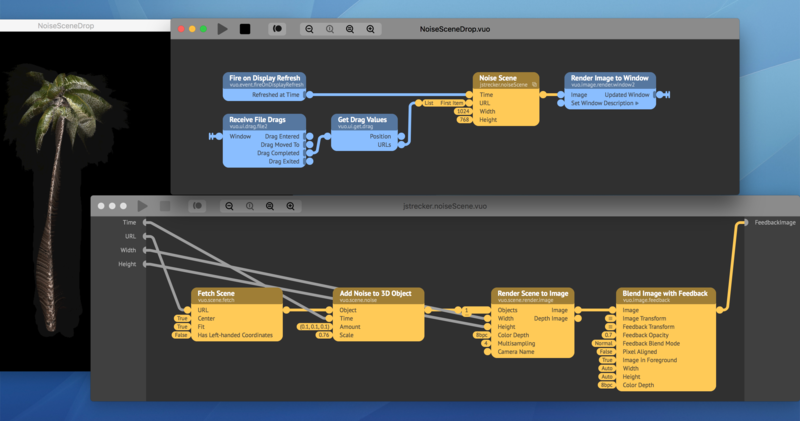 Vuo compositions running inside of VJ apps, FFGL plugins, and Final Cut Pro X plugins will behave similarly. Published inputs will only emit events when their data has changed (not on every frame). So your compositions will run more efficiently by default, without your having to add Allow Changes nodes. How will these changes affect the compositions you already have? See our guide on updating compositions from Vuo 1.x to Vuo 2.0. TL;DR: If your composition contains community nodes, subcompositions, or published ports, you may need to make some changes. Otherwise, your composition will run the same as before (except 3D lighting will look a little different). 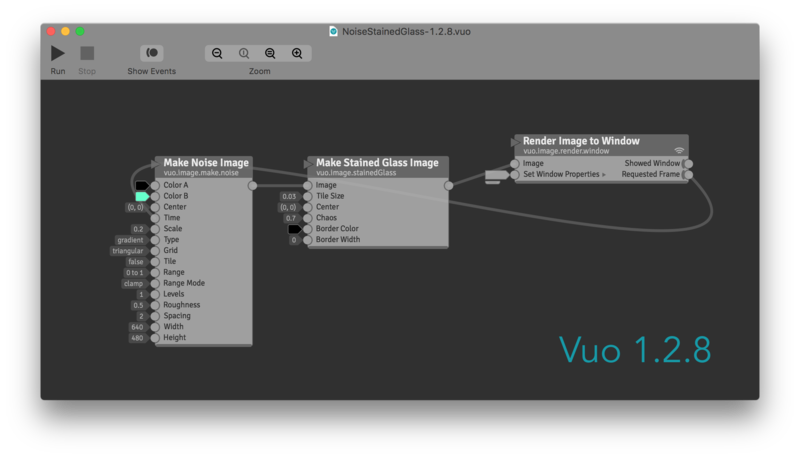 When you create compositions in Vuo 2.0, they probably won't work in earlier versions of Vuo, because of all the new nodes. How comfortable it is to interact with an app depends on how it looks. Does the design succeed in making complex things simple to understand? With advice and even mockups from the community, we've continually worked to remove clutter from Vuo's user interface. As we test Vuo 2.0, there are some changes that we've quickly grown accustomed to, that we miss when we go back to Vuo 1.2.8. One such change is the new cable paths. Vuo 2.0 draws cables using an algorithm inspired by suggestions from Bodysoulspirit, mnstri, Philip, and vade. Long cables are straight instead of curved. This makes it easier to see which nodes are connected to which. Vuo 2.0 is not the first time or the last time that we'll be updating Vuo's appearance, but it's by far the most redesigning we've done in any single release to date. In harmony with the redesigned appearance, Vuo 2.0 has a redesigned app icon and logo. A while back, Bodysoulspirit started a community discussion about a new logo for the next version of Vuo. He must have been on the same wavelength as Team Vuo, because we had just started discussing the same thing amongst ourselves. In the community discussion, Bodysoulspirit, DDAANNYYBBOOYY, Azy, and GeorgeToledo suggested a mélange of interesting designs. Thank you so much! Along the way, we learned a lot about what folks in the community like and dislike about logo designs. With that knowledge in hand, we hired a design firm local to us, Red Tail Design Co. We showed them some of the community's designs, explained that there were many aspects we liked but we hadn't yet found "the one", and asked them to propose some designs of their own. Over a span of several weeks, Red Tail Design worked with us to come up with a distinctive concept and refine it into a finished design. We ended up with a logo that we're happy with, and we hope you are, too. Before we release the final version of Vuo 2.0 to the world, we're going to release a beta version to the Vuo community. This will give you a chance to try out the new features, and will give us a chance to fix any major problems that you discover before the final release. Who can be a beta tester? Anyone who's ever bought Vuo. When can you start beta testing? We estimate that we'll release the Vuo 2.0 beta sometime between April and June. Whether you're a Vuo virtuoso or just getting started, we heartily invite you to try the Vuo 2.0 beta when it's released. We'd appreciate feedback from all perspectives. We hope this post will give you a head start in getting accustomed to the new look and behavior of Vuo 2.0. If you know anyone who might be able to use Vuo 2.0 in their work, you can give them a head start, too, by sending them the Quick Start tutorial or our tutorials on creating Final Cut Pro X plugins and FFGL plugins. Read more about What makes Vuo 2.0 more comfortable to use? 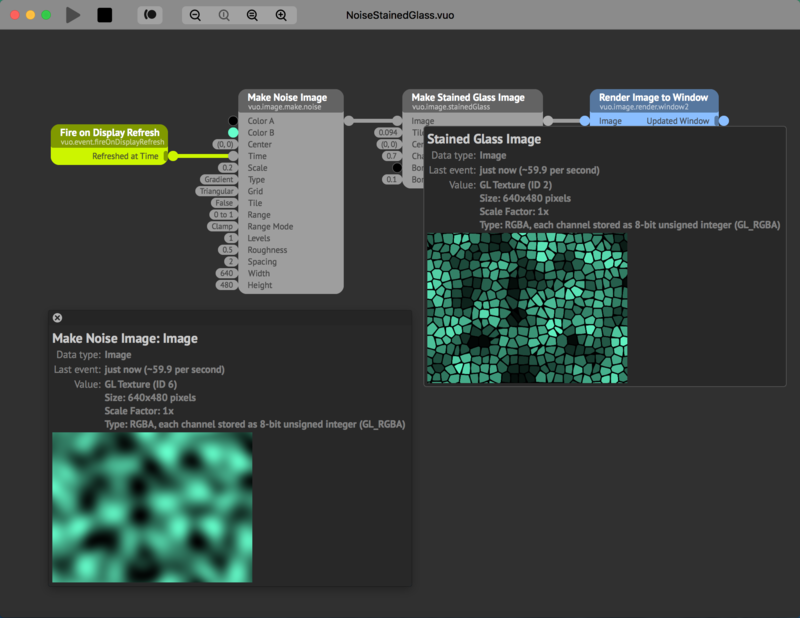 You could try with NI mate and the Filter Skeleton node.